Diabetes is a condition in which the blood glucose levels (sugar levels) is too high. There are mainly two types of diabetes; Type 1 and Type 2. The difference between these two types is that in type 1, your body cannot make insulin whereas, in type 2 the insulin that your body makes either can’t work effectively or can’t produce enough of it. 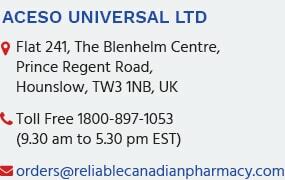 To get high-quality generic diabetic medications, shop from ReliableCanadianPharmacy.